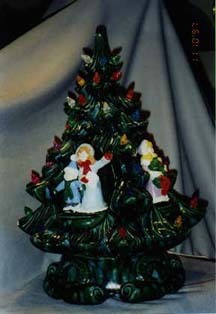 M-301-Plan ahead with this special Christmas ceramic tree. It has three removable Carolers (2 shown) and has all the lights, which are colored plastic, that reflect the light from inside. It has a wind-up music box that works. 12W x 16 1/2H. Some minor chips to the ceramic. The weight is 8-1/2 lbs $105.00.